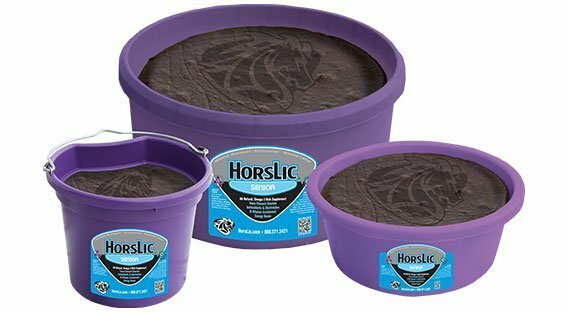 HorsLic Senior is an all-natural, low-moisture supplement that delivers essential nutrients, antioxidants and omega-3 fatty acid benefits 24/7 to support the specific nutritional needs of older horses. Available in 60-lb w/lid, 125-lb, 250-lb tubs and convenient 40-lb flat-back buckets. Higher levels of omega-3 fatty acids to boost energy for elderly horses. Higher levels of added biotin, riboflavin, and thiamine for elderly horses. Greater levels of flax fiber, higher oil content for increased energy density. Higher levels of vitamins A and C and natural flaxseed lignans and molasses melanoidins as antioxidants for the aging horse. Increased electrolyte levels for senior horses.